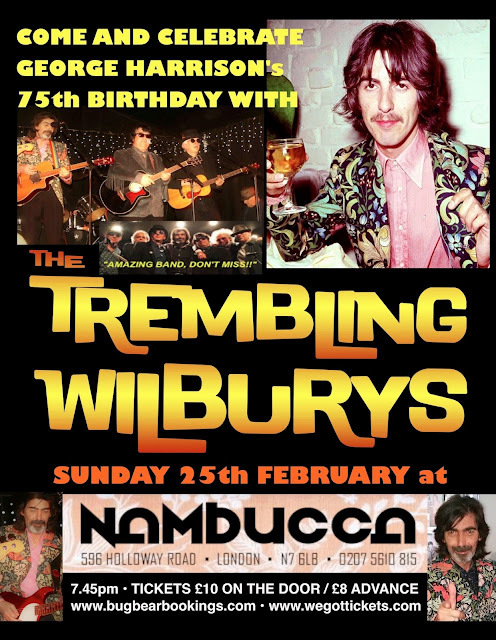 Top tribute band the Trembling Wilburys are celebrating what would be George Harrison's 75th birthday on Sunday 25th February at rock venue Nambucca in Holloway Road, north London. Frontman Glen Knowler looks and sounds uncannily like the late Beatle & Traveling Wilburys co-founder Harrison, while the band also pays perfect homage to his Wilbury bandmates - Roy Orbison, Bob Dylan, Jeff Lynne & Tom Petty. The band have been going for over six years mainly playing venues all over London & the South East, as well as venturing to other cities such as Birmingham, Mons (Belgium) and Liverpool where they played the legendary Cavern Club last October. Drummer and band founder David Stark commented, "We've played some amazing gigs over the past few years and the band generates an incredible energy which everyone seems to love. Apart from Glen we have Dave Collison as an impeccable Roy Orbison, Andy McNish doubling up as Bob Dylan and Tom Petty, and bassist Marko Laver doing the honours as Jeff Lynne. Meanwhile lead guitarist Dzal Martin always gets the cheers for his incredible solos, while keyboard player Howard Robin (aka Ludwig van Wilbury) completes the line-up. We're really looking forward to playing Nambucca for the first time, it's an excellent venue with a great bar and sound system." 2018 also marks the 30th anniversary of the Traveling Wilburys' debut album 'Volume One' featuring such hits as 'Handle With Care' and 'End Of The Line', and the band is hoping to perform this classic album in its entirety on the night subject to final rehearsals. Their 2-hour show also features a selection of solo hits by the individual Wilburys including Beatles & ELO songs like 'Taxman', 'Something', 'While My Guitar Gently Weeps', 'Hold On Tight' and 'Roll Over Beethoven'.